In this issue of TV Times : Since 1955, TV Times has been at the very heart of British television. Every week TV Times talks to the biggest stars and goes behind the scenes of the nation's favourite shows. 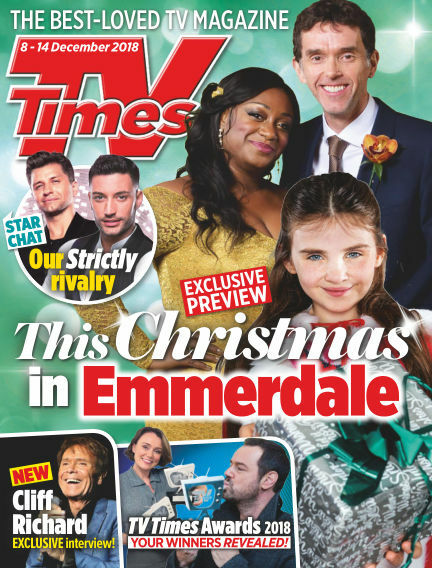 Exclusive shoots and interviews, the latest news, unrivalled soaps coverage, pages of film reviews, a daily spread of highlights - where the best shows are previewed and rated! - plus 42 pages of listings make TV Times an essential and comprehensive guide to the week's TV. TV Times also contributes to www.whatsontv.co.uk, and its Facebook page is abuzz day and night with what readers are watching and why - because, after more than five decades in the business, online or in print, TV Times is still Britain's best-loved TV magazine. To find out more about TVTimes click below to watch a video of Ian Abbott, editor of TV Times. With Readly you can read TV Times (issue Dec 8 2018) and thousands of other magazines on your tablet and smartphone. Get access to all with just one subscription. New releases and back issues – all included.